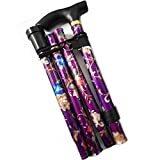 Deluxe Black with Silver Etched Flecked Stripes Pattern Ladies Adjustable Walking Stick - 23" - 38.5"
Walking Stick Holder, pack of 2 ties for easy safe walking stick storage. 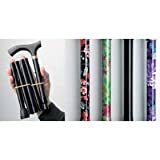 Stick Safe - Stop your walking stick from falling to the ground from your chair, mobility scooter or anywhere you need it. 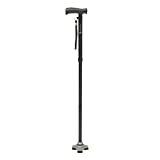 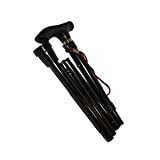 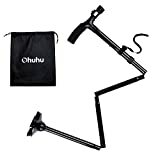 Aquarius Drive DeVilbiss Healthcare Folding Walking Stick. 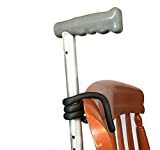 Soft Grip Gel Handle. 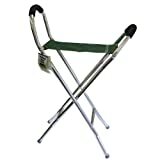 Folds into 4 convenient parts for easy storage. 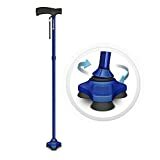 Hard wearing, non slip ferrule provides stability on various surfaces.